A batch of smoked rib tips makes a great pre-barbecue appetizer or a tasty main course. I like to cut them into finger food size pieces before they are seasoned and smoked. 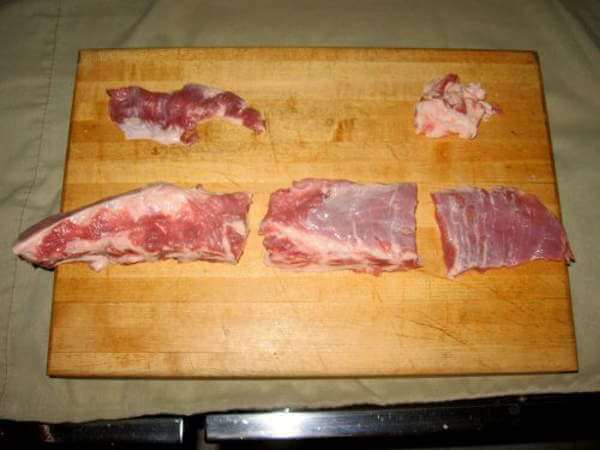 As you can see on rib preparation page, the rib tips comprise the right two-thirds of the long strip of meat above the bony slab. (The left end holds the sternum bone.) It contains small pieces of cartilage and some fat, but also a lot of tasty meat. Cut the rib tip strip into two inch sections, and season the pieces with dry rub before smoking them for 2 to 3 hours. This dry rub mix keeps the flavor mild and mellow. Mix up these ingredients and lightly coat the rib tip sections. For more flavor, marinate the rib tips in a beer and hot sauce marinade for a couple of hours before seasoning with the rib rub.